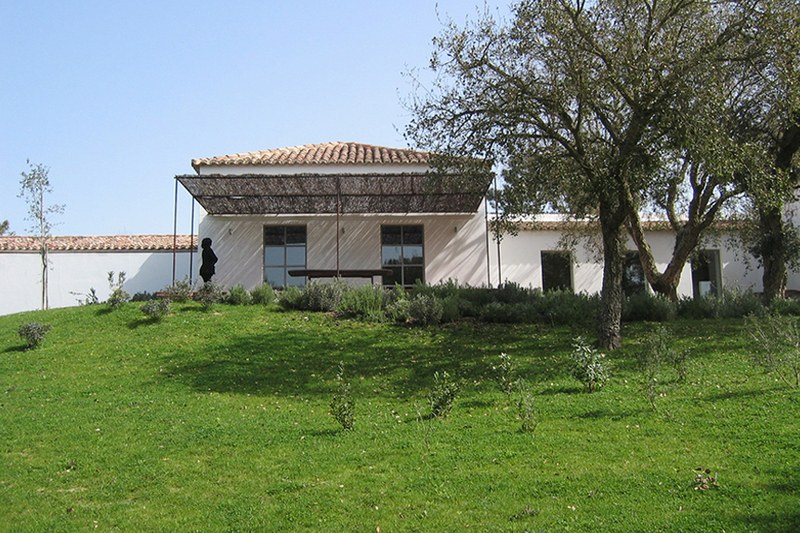 About 14 years ago, at the beginning of our professional practice, a masterplan for the Quinta do Picão in Azeitão was developed. In this plan we fulfill generous goals at the request of the owners: find 30 places with about 1ha each to build 30 houses. 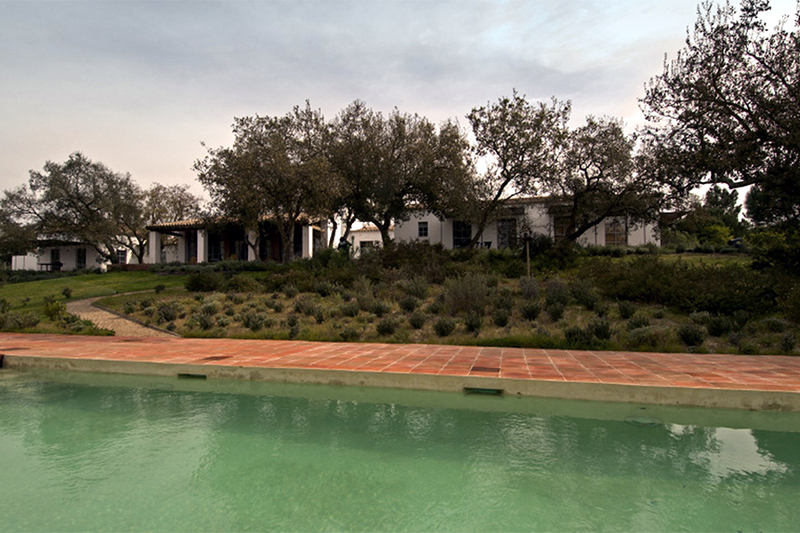 The choice factor for the location of the lots was related to the characteristics of the landscape, where the objective would be the integration of the houses into lots delimited only by the natural elements, fully integrated in the Landscape. 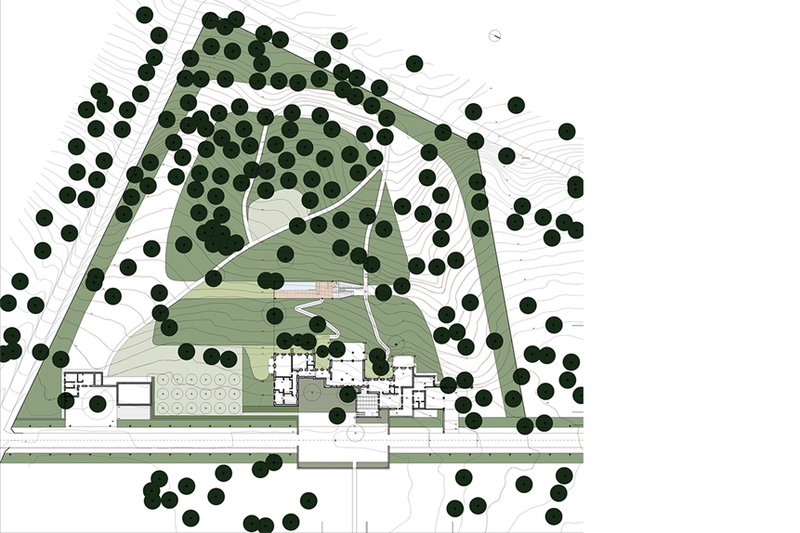 The Landscape Architecture project for the House in the Picão farm, elaborated in 2000/01, occupies the area of two contiguous lots, on a west slope characterized by a predominant occupation of cork oaks with some scattered pines. 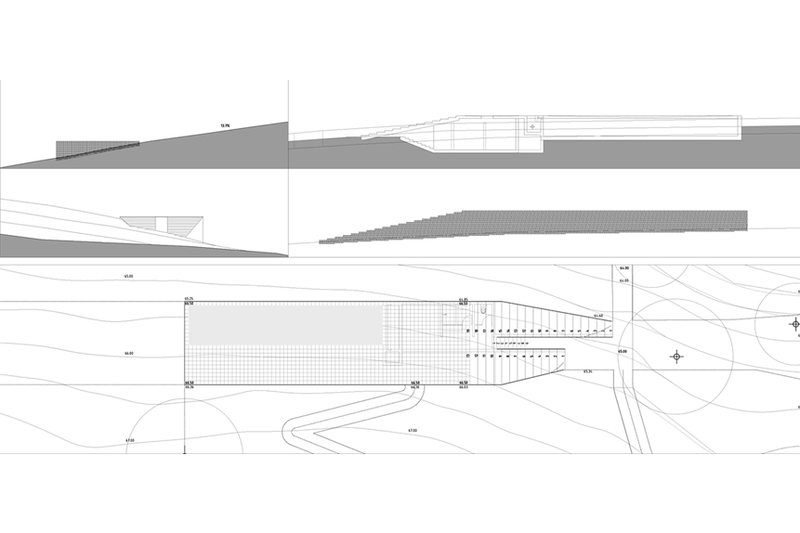 It is a project of integration of the house and the Garden, where the spaces open and closed participate in the composition of the great landscape characterized by the extensive várzea (floodplain) that occupies the valley to the west contained by the wooded slopes. 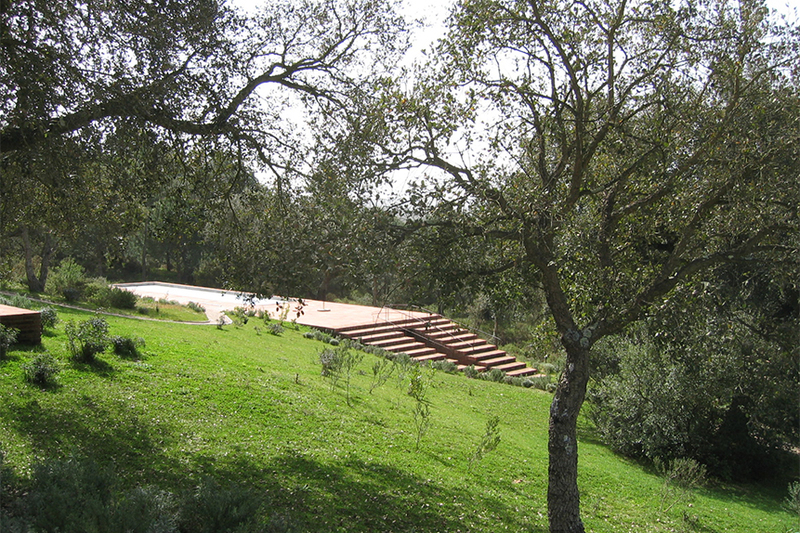 The location of a swimming pool, as well as the outdoor spaces associated with the house and the use of the garden, articulated with the construction of paths, constitute the program for this space built in a clearing where natural and vegetal elements are fundamental in structuring and definition of the boundaries of the nearest landscape. The one-story house is located on the high point of the slope and the construction is excavated and buried in relation to the access road at the top of the lot. 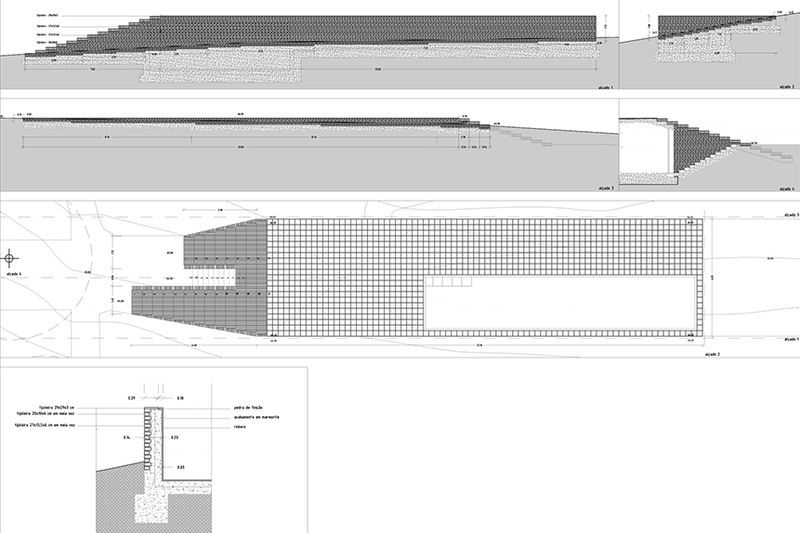 With the aim of integrating the house in the landscape in a natural way, we looked for a construction system capable of integrating this mismatch of dimensions of the construction of a platform in the hillside. 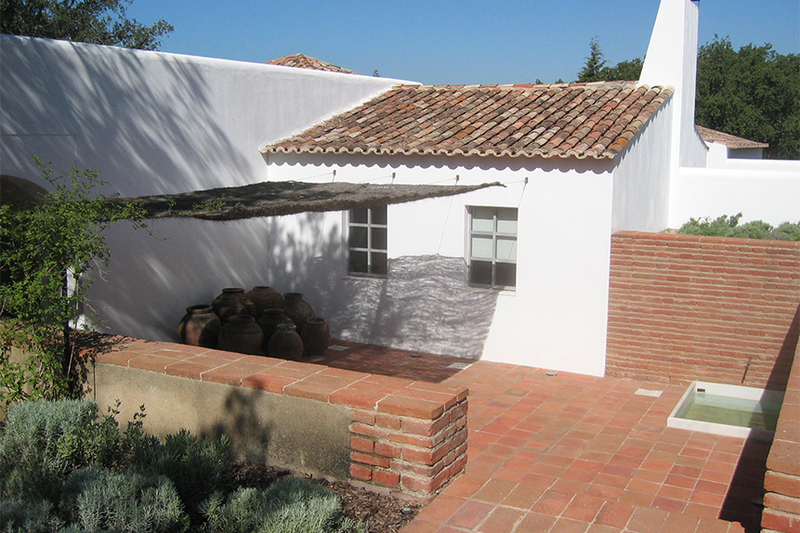 It was proposed the construction of a set of exterior spaces, such as patios and terraces directly related to access to the house, built in excavation or landfill that will articulate the different levels between the level of implantation of the house and the surrounding land. 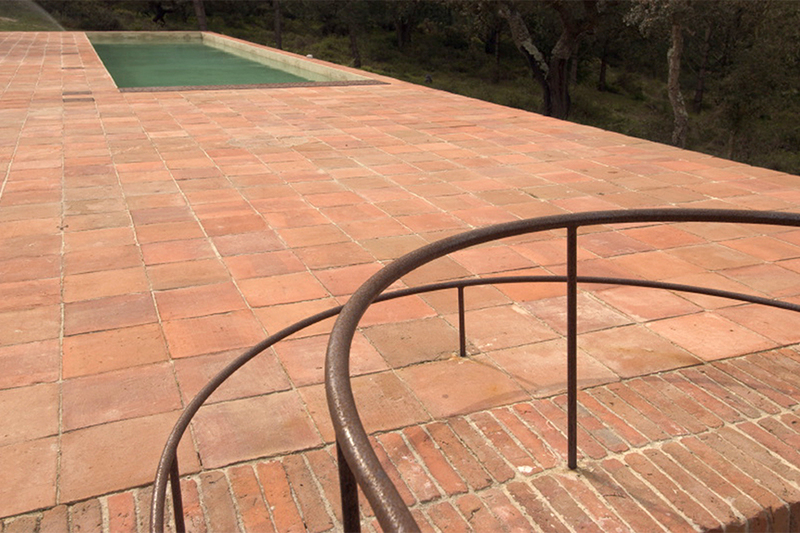 This construction, made with brick and handmade adobe brick, comes to create a common language in the relationship between the house and the exterior, which will be repeated in the construction of a swimming pool inside the cork oak forest. The main entrance, about 1.5 meters below the height of the road is made by constructing a courtyard excavated in the ground that allows the backrest of land and simultaneously, articulates the different dimensions with stairs and adobe brick walls that make the Containment of land. This patio provides a first entrance space, whose freshness is given by trellis and accompanied by the noise of falling water in a small marble tank. 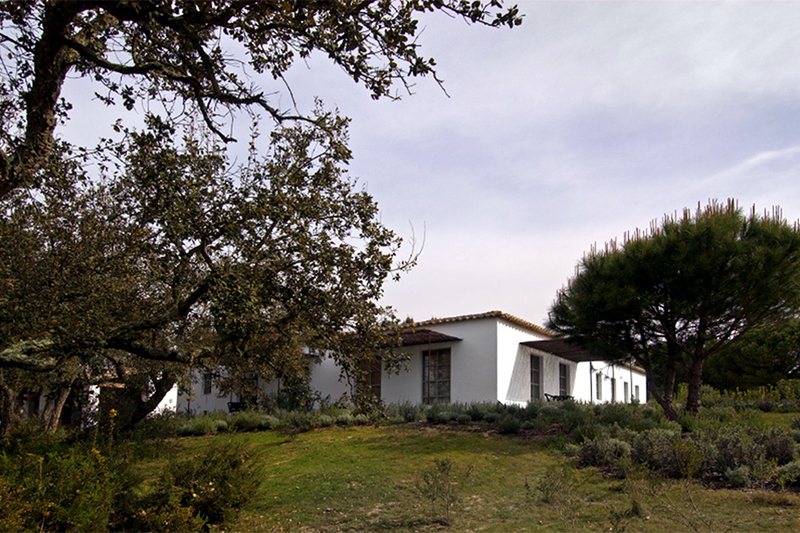 In the relationship of the house to the west, it was proposed the construction of terraces that advance on the garden and settle on terraces also in adobe that resolve the encounter with the land, promoting living spaces articulated with the pockets of vegetation that prolong the garden To the house. 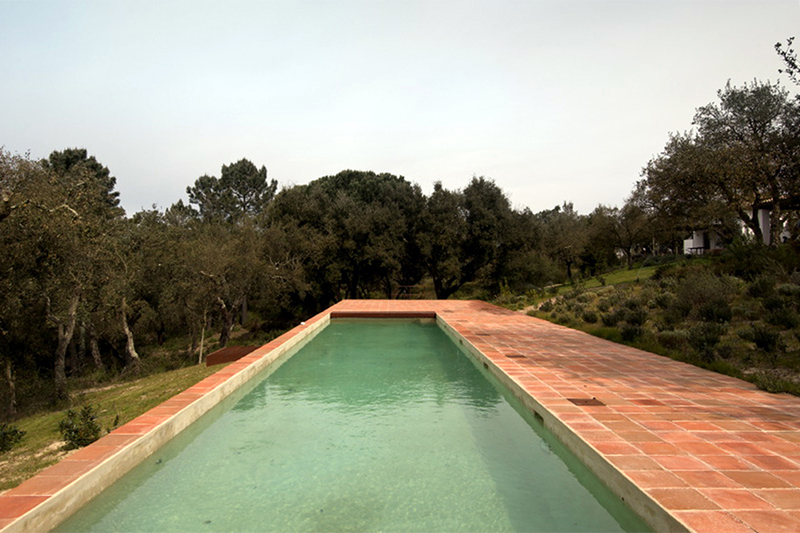 The swimming pool, of elongated proportions (3,5mx15m) is built about 20 meters from the house, in a clearing inside the cork oak forest. 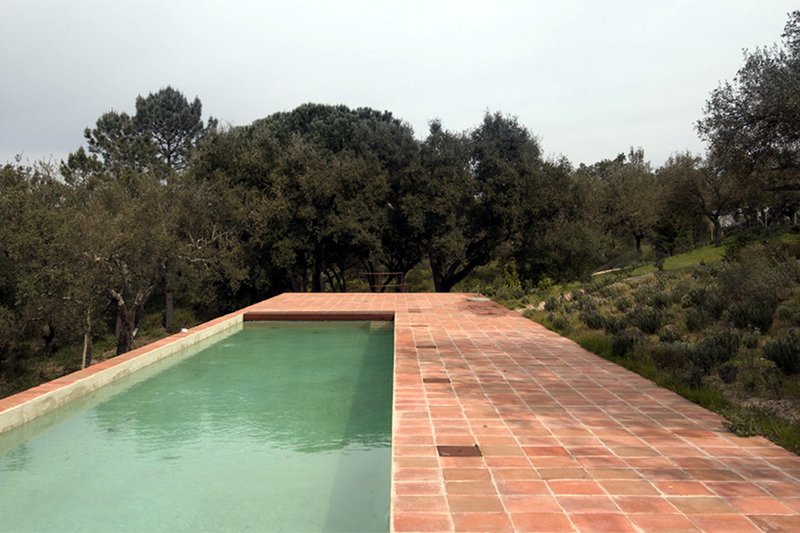 The pool is noticeable from several points of the garden, filtered by the hedges of gorse with leafy, blood and aderno and also by the crowns of cork oaks, which when lighted appear suspended around the platform of the pool. Once again this platform is built in a landfill integrating in its construction a semi-buried floor where the technical zones and health resorts are located. 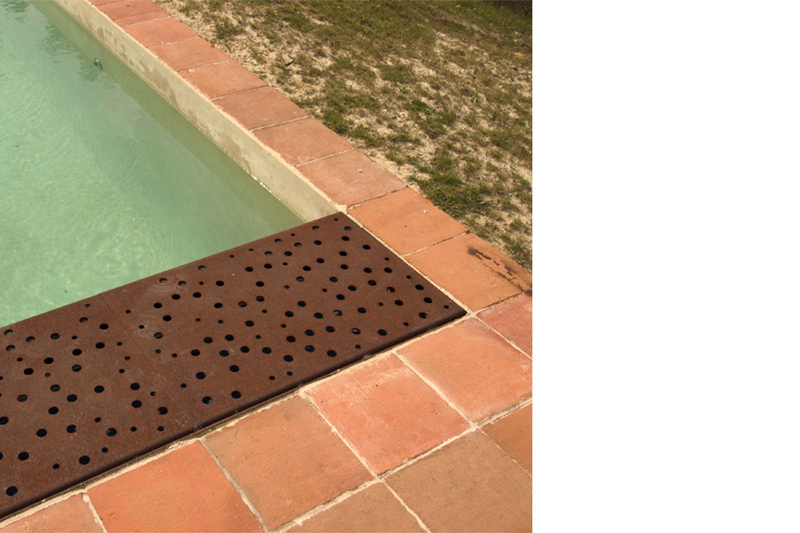 The articulation between the dimensions of the platform is drawn through stairs that detach themselves from the terrain and articulate the dimensions of the terrain with the platform of the swimming pool and the buried resorts. The search for continuity between the forest and the garden areas around the house was a key factor in the choice of proposed plantations. As an intervention strategy we opted for the cleaning and slaughtering of selected trees with the purpose of promoting and densifying the vegetation with interest, in particular, the cork oaks and existing bushes. In a second phase it is proposed the planting of shrub species from the existing zones, the careful planting of sub-shrubs and also the sowing of meadows that in an intercalated form cover the soils between the forest and the house. 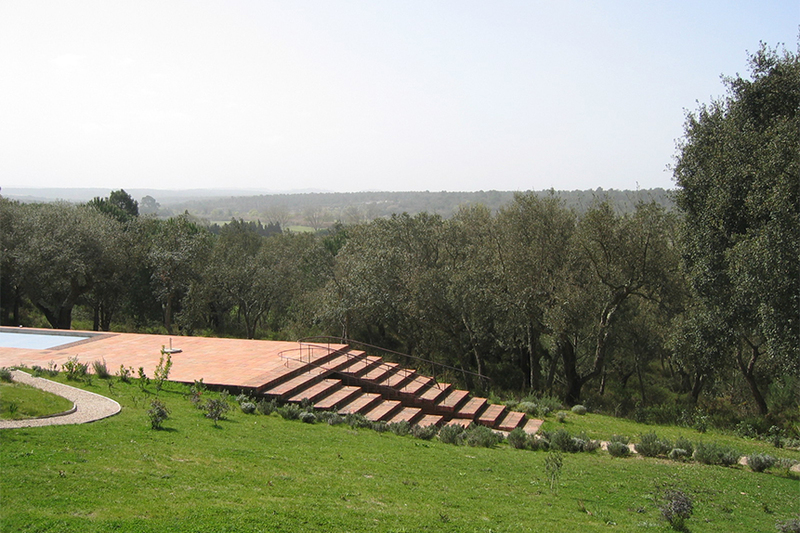 The different spaces are experienced through a course in clay that crosses the space in its multiple dimensions, relating the Garden with the Forest through a diversified experience of zones of sun and shade, and several points of view on, the house the Garden and The elements that compose it. 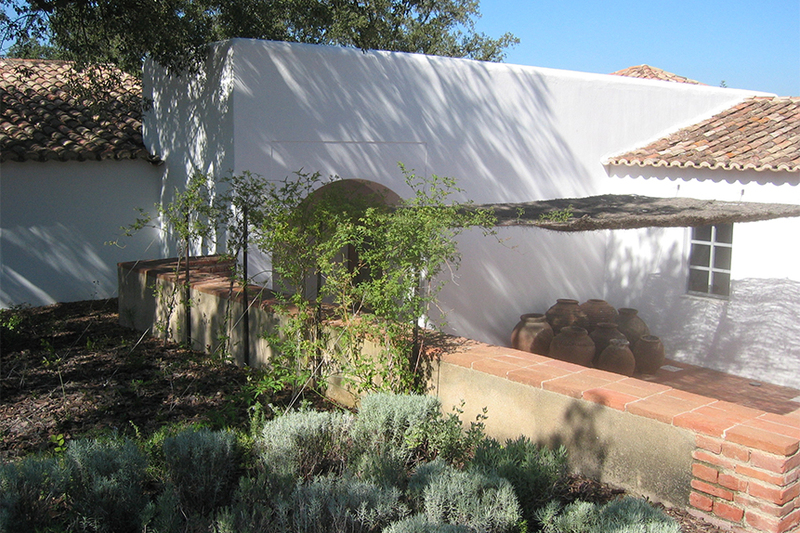 The other spaces around the house acquire different themes, emphasizing the planting of a citrus grove located to the south of the house, contained by hedgerows and Romanzeiras, and the entrance courtyard delimited by laurels and sub-shrubs . PROJECT DATE 2000-2001 (design) 2003 (construction) | CLIENT Private Client | AREA 2Ha.